If you had to pick the single most important part of an email message, what would it be? Most of us would answer: the email subject line! There are plenty of critical parts to an email message – the call to action, the message body, the pre-header text. But nothing’s quite as influential as the email’s subject line. 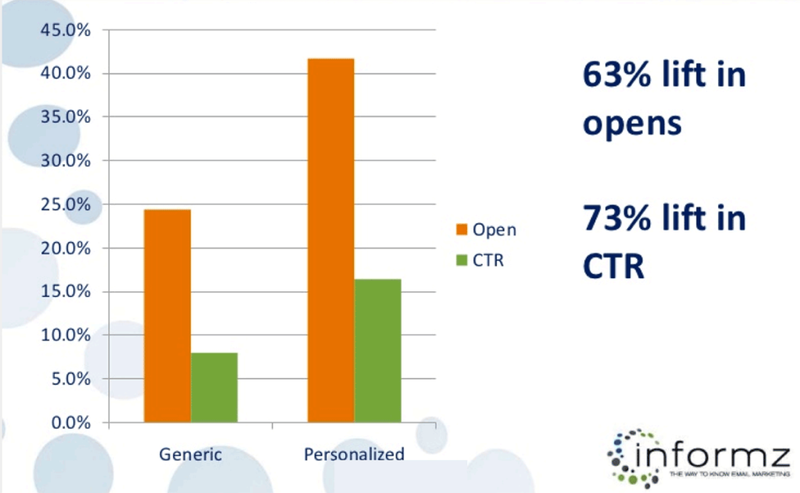 35% of email recipients will open an email based on subject line alone, according to the Convince and Convert blog. That’s the good news. The bad news? 69% of email recipients will mark an email as spam based on the subject line alone. Yikes. Get your email subject line right, and you’re almost sure to have a successful email. But botch it, and you could see a mean spike of spam complaints. It’s important to think of a subject line the right way. It is like a headline, but not quite. The difference between a headline and an email subject line really falls to how we interact with each of them. Headlines need to grab and hold attention. Email subject lines do this too, but what they really have to do is to survive your subscribers’ culling process. Every day, your subscribers get a hundred or more email messages. 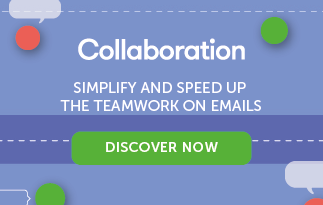 If they’re in a busy B2B environment, they may get several hundred emails per day. Because of the crush on information coming into our inboxes, we’ve all had to get really good at deleting what we don’t need. Without a compelling and clickable subject line, your email will fail the split-second test your subscribers put it through. It will be deleted on the spot. Your email subject line has to hook them enough so that they just can’t quite bear to cull it. It has to make them want to find out just a little bit more. So how do you write an email subject line that can survive that first cull? Which magic words should you apply to charm your subscribers’ hearts? Well, I’m no magician. I don’t do hypnosis, either. But I am an amateur split-testing scientist. So I’ve found some interesting email subject lines split-test experiments for you, and a bunch of research studies, too. Maybe they won’t act like fairy dust, but consider these the next time you need to add some sparkle to an email subject line. 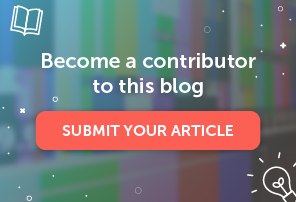 You’ll hear about personalization over and over again in email marketing – it’s one of the biggest opportunities email marketers have to boost results. Subject lines are the most likely place to test personalization and to get the kinds of results we all want so much. Marketing analytics company Retention Science knew that personalization would make a difference. So they studied 267 million emails across 543 retail email marketing campaigns. They discovered that email campaigns with a subscriber’s first name got 2.6% more opens than emails without any personalization. Informz also ran an email subject line personalization test. They found personalization lifted results, too. In the opening of this post, I said I didn’t have any magic words for you. Well, maybe I do. Just two, though: “Free delivery”. According to Adestra’s 2013 Email Subject Line Analysis Report (view), using the words “Free delivery” in an email subject line will lift open rates by 50.7%. “Free delivery” will also lift click-through rates by 135.4%. These measurements are for the overall sample of emails that Adestra measured – a pool of over 2.2 billion emails. Just to give you a wee taste of some of the data from this study, here’s the chart of best and worst performing words for email subject lines from Adestra’s general sample. Be sure to choose your keywords carefully as some can trigger SPAM content filters. Here’s our list of spam words to avoid. It’s an interesting table to ponder. But just for some contrast, and for some proof that you shouldn’t take what marketing studies say as gospel, here’s the results of a very interesting test MarketingExperiments did. Their test cells specifically used the words “Free” and “Home Delivery” in the subject lines. 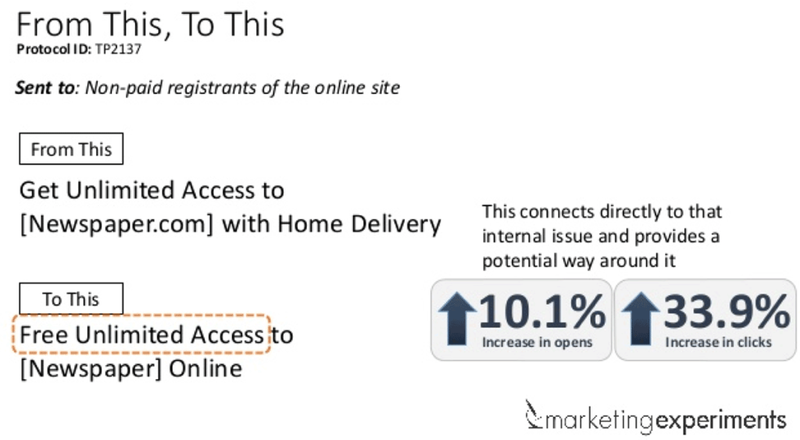 But in the MarketingExperiments test, the “Home Delivery” email subject line did not win. 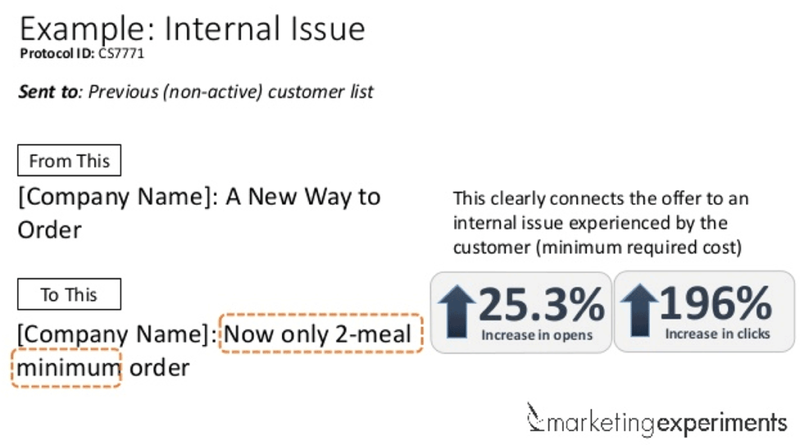 Some marketers use brackets in their email subject lines, just like the example from MarketingExperiments. Brackets can set off a word, phrase or brand name in a way that makes a difference. Copywriter Joanna Wiebe was skeptical about how much of an effect brackets would have on her subject lines… until she split-tested them. For her test, she included her company name in the brackets. Her tests show it actually does help lift response. There is plenty of other anecdotal evidence of marketers getting a lift with brackets in subject lines. Sometimes the emails have a call to action in the brackets. Other times it’s the company name, as in this example. You probably won’t see a massive 30% lift if you add brackets to your emails, but it’s definitely worth a few tests. 4) Subject line length: keep it short! 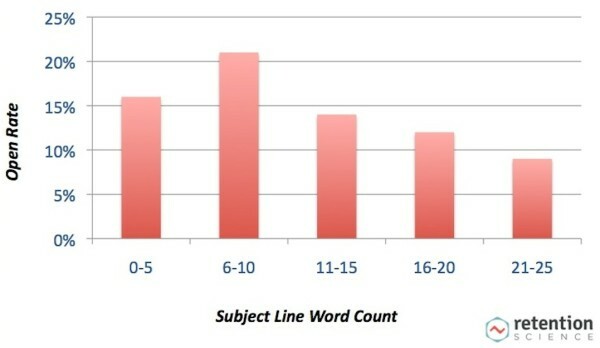 Email subject line length gets tested and talked about more than anything else. Almost every test comes out in favor of shorter subject lines. Retention Science did an analysis of 267 million emails and found that shorter subject lines do better – to a point. After reviewing the data, they recommend you keep subject lines to no more than ten words. Why keep subject lines short? Mobile. Smartphones only display the first five or six words of a subject line. So shorter subject lines tend to capture mobile subscribers’ interest better. Here’s a different subject line length test from Informz. Their shorter email subject line also beat out the longer version. It’s good to use best practices and to optimize your subject lines as much as possible. Just don’t take it too far. Don’t cross the line into being deceptive, or even downright spammy or your subscribers will punish you for it. 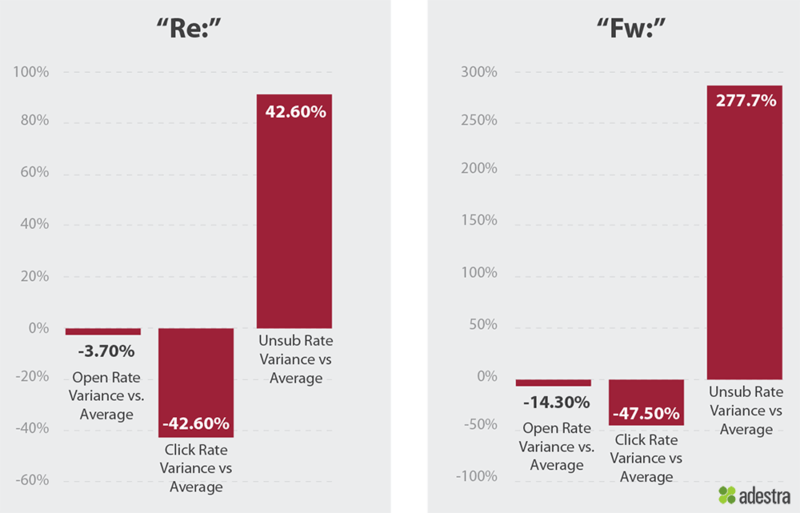 Adestra’s report showed that email marketers did get a lift the first time they tried using “Re:” and “Fw:” in subject lines. But the second time they tried it, it crushed their results. 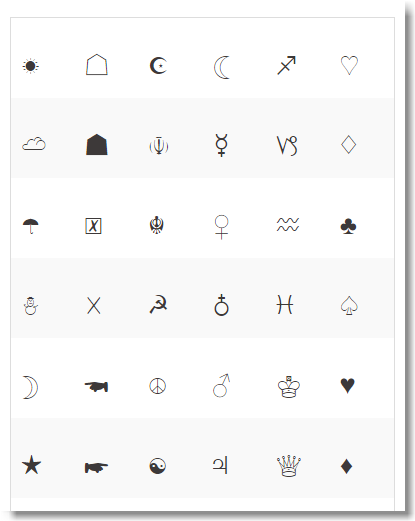 6) ☛ Unicode symbols can help! There’s a lot of advice about using numbers in email subject lines, but no actual test results to show you. However, I think the reason numbers do well in email subject lines is not necessarily because they’re numbers. It’s because they’re specific. Generic-sounding subject lines rarely spark a reader’s interest. Remember: You’re always competing with hundreds of other emails. Anything that isn’t specific and compelling will probably get deleted. Here’s a test from Marketing Experiments. 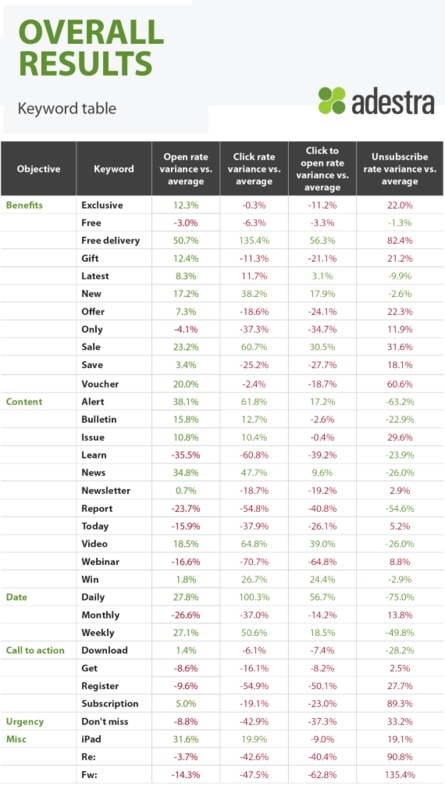 It shows how specificity increases email opens and clicks. These tests and research studies are all very interesting. Just don’t forget they lack one critical piece of information: How your emails actually perform. None of these studies or tests necessarily applies to your list and your emails. They only illustrate best practices. The only way to know what actually works for you is to test, test, test! And to be safe, we recommend you run at least a few tests with statistically valid results. Then call a winner and change your emails for good. 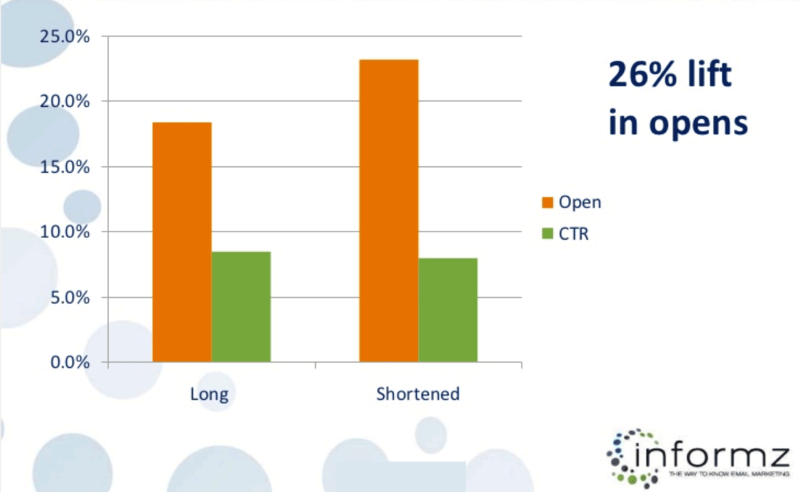 – to see a test where the longer subject line beat a shorter one by 62%. Do you A/B test subject lines? If you’ve had any interesting results from tests lately, we’d love to hear your results. Tell us about them in the comments.